"No living man, within five years of his age, is as strong as he, or can perform the feats of strength which Dan Rice can, and to this he challenges the world! And now, hurrah! 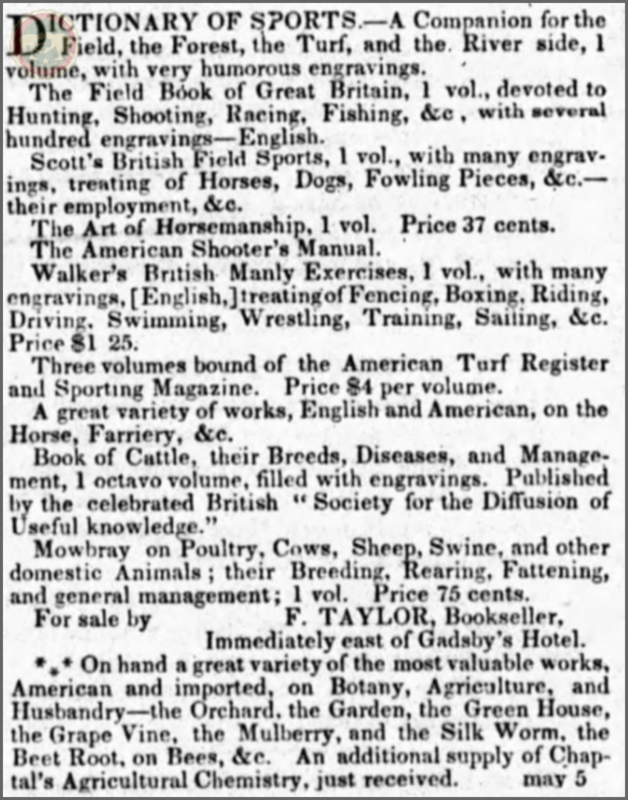 for the most unique and attractive exhibition in Philadelphia, on Christmas Day and evening." This show starts at 11:00. Also featured Mr. D.T. and Miss Shaw, and Mr. Harrison, the improvisatore. This show starts at 15:00. This show starts at 191:00. "The chief feature of the evening, however, was the appearance of a man in a mask, who was unknown to the managers of the establishment, and who had come here to-night in pursuance of a challenge which he had sent eu amateur to the champions of the arena. I was not made aware of this feature of the entertainment until during the progress of the second battle. The theory of the person who communicated it was, that the masked man was some gentleman, or perhaps even a nobleman, who, having a passion for athletic sports, had taken this singular method of enjoying his superiority incog. My notion was, however, that it was a trick of business to which the managers were parties, and I therefore did not anticipate any great exploit. But the audience evidently had a different estimation of the matter. I heard frequent allusions to l'homme masque all through the evening; and, finally, when the master of ceremonies announced that he had arrived, the amphitheatre was started with unmistakable evidences of excitement. The two gladiators who were then in the ring, and in the very climax of a tremendous struggle, at once left off, in concession to the superior demans of the mysterious amateur. No sooner had they retired, however, than a young giant who was announced as Monsieur Fouet, stepped forth, and commenced slouching leisurely around the circle. This formidable fellow stood at least six feet three, and, though there was no waste flesh about him, he must have weighed two hundred and twenty or thirty pounds. The muscle bunched all over him in great clots of power, and his broad shoulder blades, exceeding all usual developments, seemed to have been cast in some iron foundry for a man-of-war. He was a feaful atagonist to look at, and the spectators winced concern for his opponent by expressions of fearful admiration. After he had been in the ring about two minutes, there was a stir in one of th epassages, opposite that which gave ingress to the professionals, and the crowd being parted by the efforts of a gendarme, a figure emerged from it shrouded in complete black, and lightly stepped into the arena. His first act was to sit down on the edge of the ring and slip off his shoes. He then rose, took off his cloak, and, handing it to a female attendant, appeared in complete white hose, with the exception of his head and face, which were covered by a black hood and cowl. Not even the color of his hair was to be seen under this disguise, and the only thing naked was his hands. As he stepped forward to the centre of the ring, I scrutinized him very closely. He stood over six feet high, on, as I guesses, about six feet and an inch. Though not so large as Fouet, he was more round in body, and there was a general look of thickness, allied to symmetry, which betokened a world of hidden strength. He probably would not scale within twenty pounds of the professional, but his weight lay upon his points, and being thus happily disposed, it represented a strength that belonged to a man of twenty of thirty pounds more. His limbs were graceful, but his loins, instead of showing the Apollonian delicacy which is noticeable in Heenan, and which had been so admired this evening in Monsieur James, were braced up with broad bands of muscle, which would obviously enable him to stand the wear and tear of a protracted struggle. I particularly noticed that his feet were small, with a high arching step, and that his hands, though neither small nor large, were very white. I was impressed by the man at once, and as he palced his left hand into the great rough paw of Fauet, I insensibly took sides with him. But he did not not need any aid. Fouet rushed upon him with a terrible impetousity, with an evident doubt of his own ultimate and resources, endeavored to carr him off his feet by a coup de main. Grasping him around the neck with one brawny arm, and nailing his right hand with the other, the giant rallied him by rapid bounds across the ring, until he had him nearly capsized among the audience; but just at this critical moment Fouet's body happened to be a shadow out of line, and this being felt by the masque, he whirled the giant off his feet, and in the next moment the two men landed beside each other on the floor. But the masque, in his new situation, was too quick for his antagonist; he succeeded in getting himself partly up and over him, next he wound his arms around Fouet's body, and then, by a deadly, unremitting pressure, which the giant vainly endeavored to resist, he forced him slowly over and over, until, by a final wrench, he laid him on his back. There was a great applause at the result, but, the masque, not paying any heed to it, merely paused to have his cload thrown over his shoulders by the female in attendance, and then hurried out, protected from any intrusive following by the officers in attendance. I have seenn this man at the arena on five occasions since, but each of these subsequent combats were attended with the same results. I have been convinced, moreover, by the manner of them, that they were all bona fide battles; and I consider that this opinion of mine ought to be better than the mere surmises of any one who was not there to see. I venture no idea upon the question as to who the man may be, but the fact that his contests have been scrutinized by the shrewedest men in Paris, who had paid their five francs to the management for the privilege of looking on, is a pretty conclusive evidence that there is no humbug in the matter. I have seen editors, actors, members of the Jockey Club, and the leading wits of Paris largely present, and it is ridiculous to suppose that such a set of persons would assist, night after night in gross imposture, or permit themselves to constantly be deceived. Another proof of the integrity of the proceeding is, that, though the management of the arena was coining money by the masked man's contests, he refuses any longer to appear, unless some champion shall be produced who has 'gone through' the experts like himself. He retires, because, like Alexander, he has no more worlds to conquer. The masked wrestler therefore, takes established rank with many other of the world's mysteries, and a new counterpart is added to the question of, 'Who is Junius?'" - Hagerstown Herald & Torch Light. Also featured boxing and dancing. 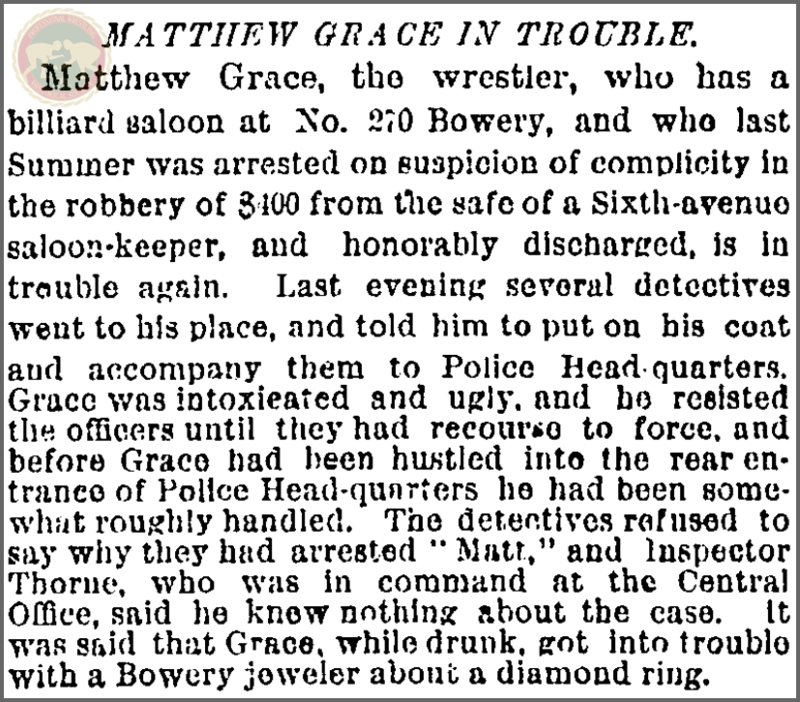 After the first two rounds of wrestling a man in the audience offered $20 that his favorite, Grace, would throw Lane. Attendance: "The Largest Audience That Has Assembled In This Theatre For Many A Day"
The Gladiator, a play, features tonight. William Miller in the part of "The Fighting Gaul," in the "great Arena Scene." This is billed as the first of just two nights when the play will be on stage. 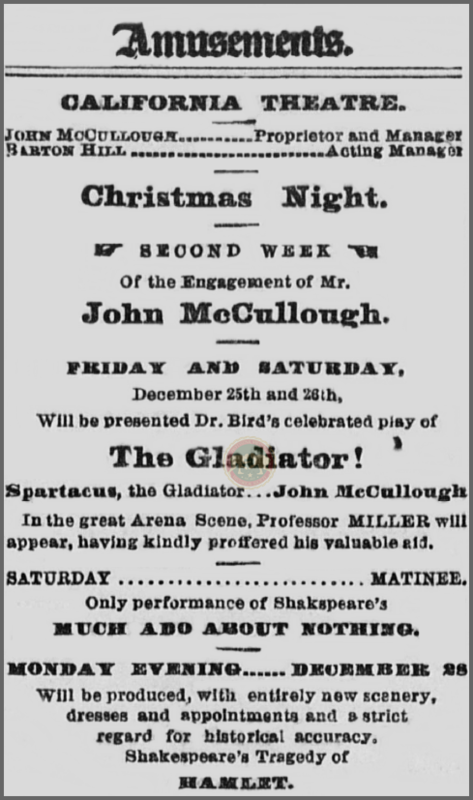 The play was written by Dr. [Robert Montgomery] Bird in 1831. It is a part of McCullough's second week at the theatre showcasing different plays. Regarding the attendance it is said that there was "Standing Room Only" and, "Enough people were turned away to fill the other places of amusement." The play was deemed a huge success, however, no mention of Miller is made. "Two celebrated bears 'Leni' and 'Marion' will wrestle with Emile Regnier and Thiebaud Bauer respectively. A special purse of $100 is offered to William Miller to win a single fall from 'Marion.' Included in the programme are Graeco-Roman wrestling, boxing and fencing matches", this took place across the afternoon and evening shows. 1 - "One Slim Young Man" def. "One Slim Young Man"
It's said Leni is about to start a tour of the Provinces following this show. Muldoon is listed as American Graeco-Roman Champion. Cavanagh died in a tragic accident, Muldoon did not know the man, but the police department wanted to organize a benefit for the family. 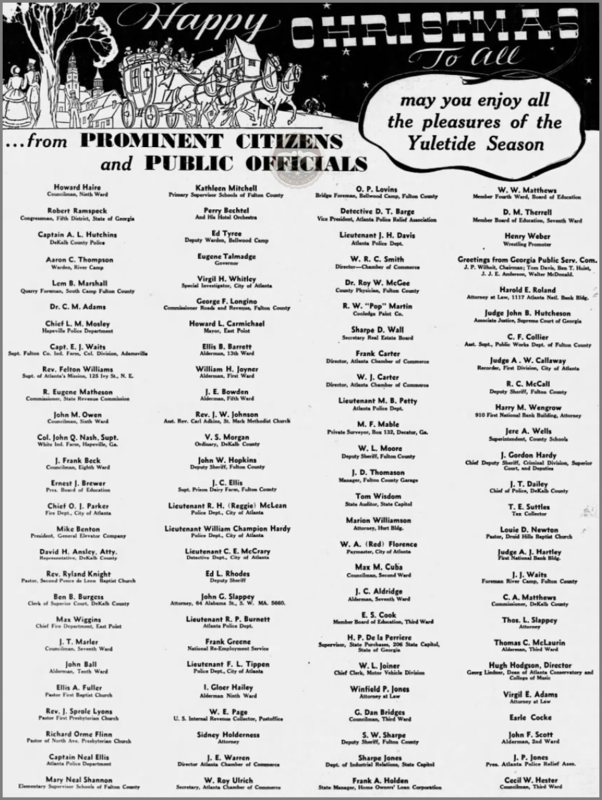 Muldoon volunteered to wrestle to raise money and he even took presents round to the family on Christmas Eve. Originally he wanted to face amateurs, however, the amateurs were warned that if they took part in a match with a professional it could stop them from competing as an amateur again. Muldoon offered an open challenge to all comers. Bau & Martin wrestled twice as no-one was willing to challenge Muldoon. Martin Muldoon was the younger brother of William. Also featured other Highland Games and events. Vangel Balam was born here. Balam wrestled for the majority of his life. He had his first child, William Vangel Balam with his wife Alexandra (Callioras Balam) in 1917. For over years they lived in the Nashua/Manchester area of New Hampshire. He was a professional wrestler and has some documented matches in the MidWest. Balam also wrestled in the New England area though. 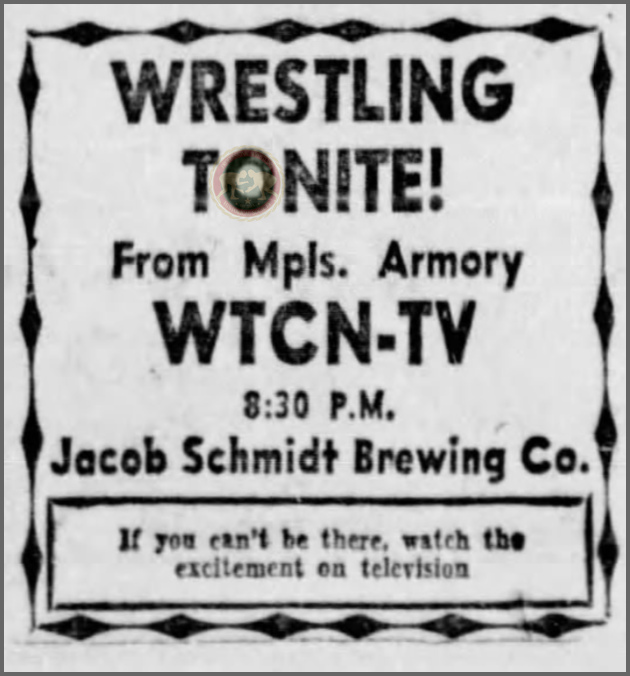 He promoted wrestling shows in Nashua, New Hampshire at least. However, it seems much of his life was spent wrestling, or otherwise, on the carnival circuit. It's known he loved the carnival way of life. As late as 1967 he was still touring with a "big carnival operation" across the country. Balam moved to Florida somewhere toward the final years of his life. Vangel Balam passed away on February 14, 1972 in Englewood, Florida. His son also wrestled professionally in the New England area. Jenkins claime claimed he had blood poisoning. He had to wear a brass buckle to hold on a bandage and steel strip on his shin. The points of the buckle he said were diggining into his skin which forced him to quit the third. Ernst Siegfried challenged Stanislaus Zbyszko. 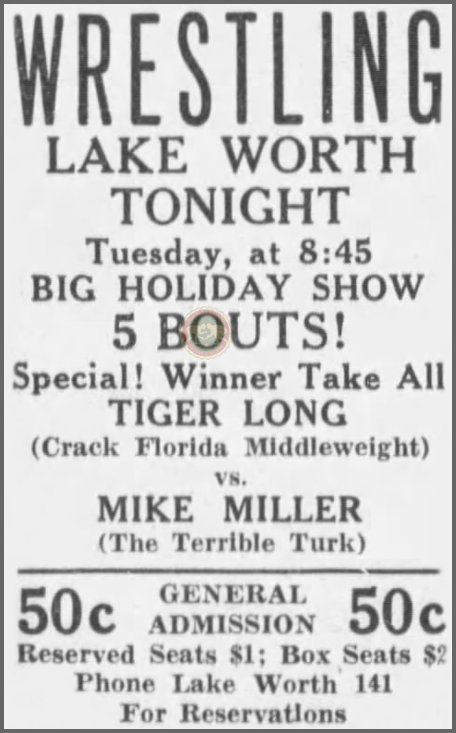 Attendance: "One of the Largest Crowds of the Season" / "Capacity House"
Reggie Parks Vs. Mr. Moto Jr. This is said to be Wright's debut here. Boyer is billed as a former football player from Syracuse University, a member of the team that "got slaughtered" in the 1953 Orange Bowl "classic." ​​Boyer is better known as the The Masked Destroyer and Dr. X. Match 2 is originally advertised as two out of three falls, but it ends up being a one fall match. It is said in the local Star newspaper of the main event that it was, "one of the wildest finishes ever witnessed at the Wrestling Arena." Tickets: "Ladies Admitted Free if Escorted by Men"
This was originally scheduled for Christmas Eve, but changed to today. This tournament started on September 15, 1967. On October 18, 1967 the tournament was stopped. On this day the tournament was restarted. It finished on January 6, 1968 with Hans-Richard Behrens winning. The three winning teams from Round 1 then had to compete in a triple elimination event. The winning team was the first one to win three consecutive falls. The final result is for the last match which took place. There were 10 teams in total in the tournament. 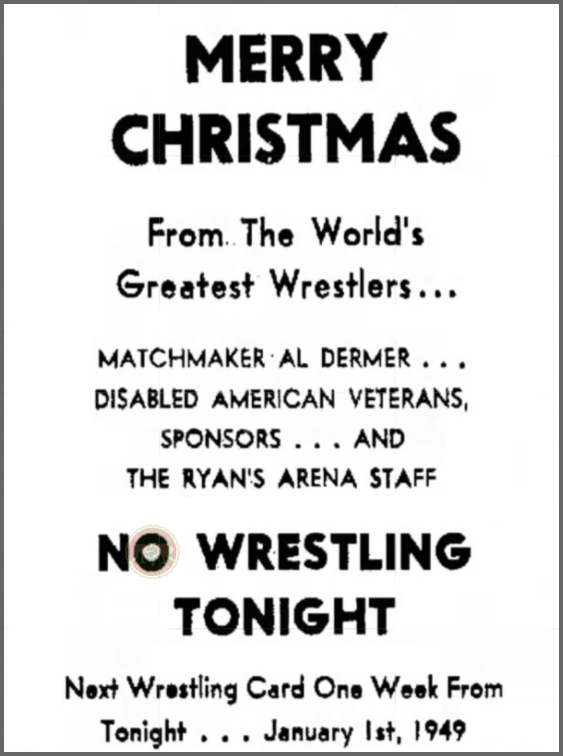 ​All-Star Wrestling: Christmas Day Special! 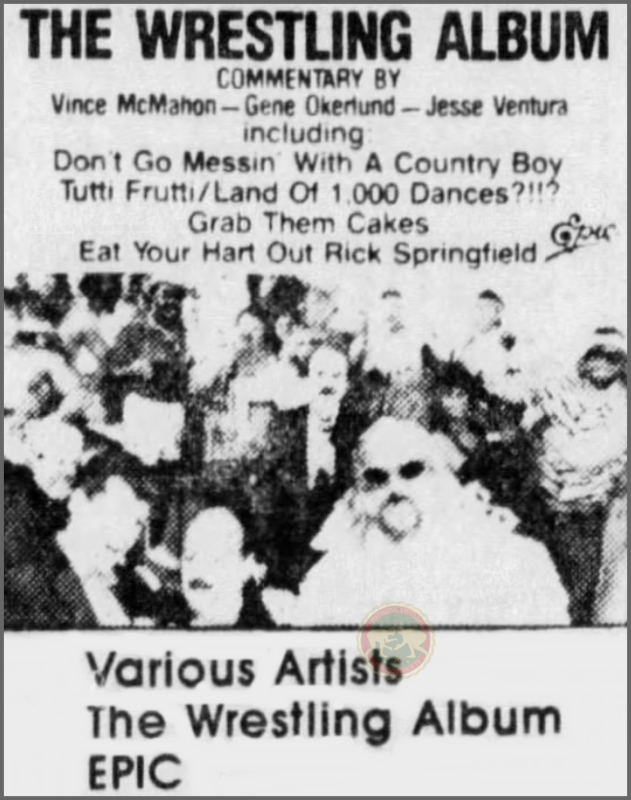 Mark II was a substitute for Jesse "The Body" Ventura. No mention is made of the mask being removed. Robinson is billed as the British Empire Champion. Jay is a substitute for Brad Rheingans. Big Daddy Bundy def. ???? Von Erich substituted for Buddy Roberts. Roberts was awarded Von Erich's belt after the fact. Hayes turned on Von Erich in the main event. All of the Freebirds subsequently turned heel. The final match led to the birth of "Red River Jack." A young Mark Calaway, WWE's The Undertaker, is said to have appeared under the Red River Jack mask at least once. It was also during this time that Calaway made his debut for WCWA as Texas Red. 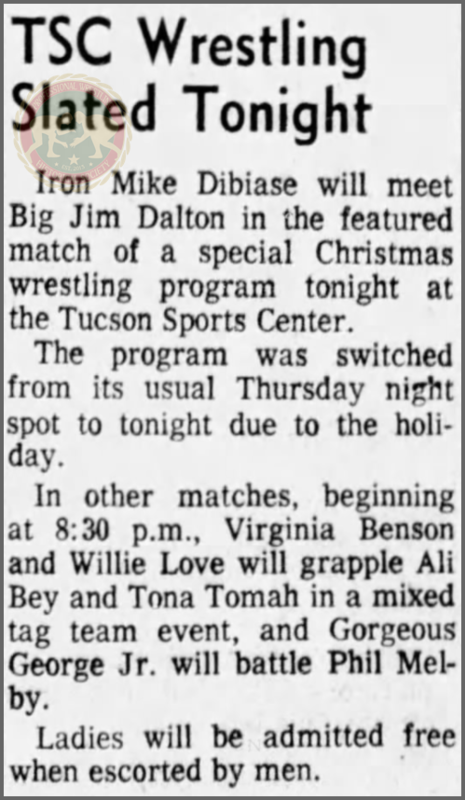 His first match according to Paul Bearer was against Bruiser Brody, the booker at the time. Bearer was working as Percy Pringle III at the time. "I swear Brody only sent you out there with me because he knew I'd need help to the back." 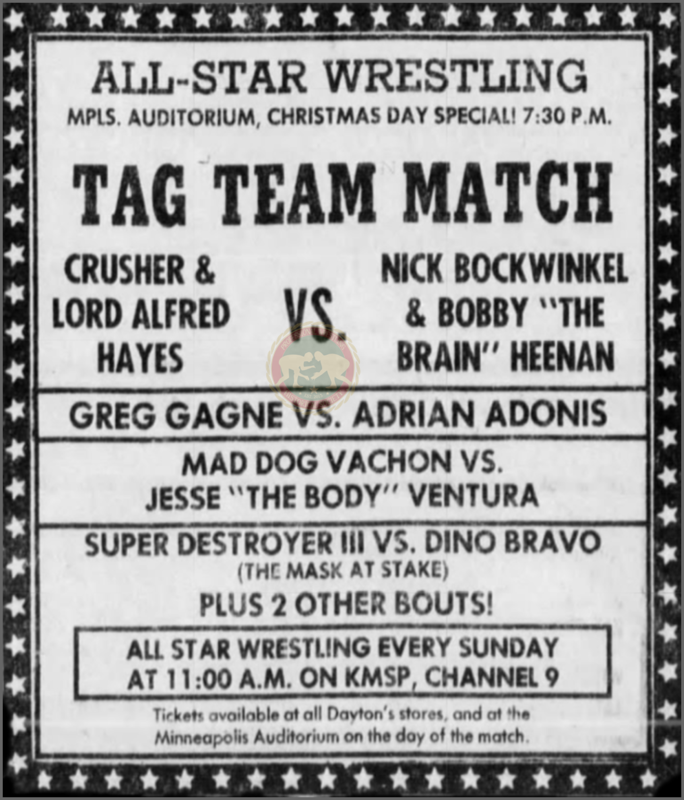 Christmas Star Wars was held by the Von Erichs from 1981 to 1987. Kerry Von Erich def. ???? At the close of match 9 Fritz Von Erich had a "heart attack." Scott Hall def. ??? ?, ??? ?, ??? ?, ??? ?, ???? Flair was disqualified when Luger attacked Savage. Of course, this is only a small sample of all of what has happened in history on December 25. I tried to put together a selection of varied and maybe not so commonly featured shows from Christmas night throughout the years. Guys like Strong Kobayashi, Chris Harris, Carl Farley, Mike Mazurki and Bronko Lubich were all born on December 25. While guys like Charles "Kid" Cutler, Wilbur Snyder and Mike Davis all died on that day. HUSTLE House have held Christmas specials. Mr. Gannosuke, Tetsuhiro Kuroda, Jimmy Garvin, and Ray Mendoza have all won titles and still I'm sure there is so much more out there with WWE adding to the annuals tonight with their Christmas Raw Christmas. Authors: Jimmy Wheeler and Jason Crozier.